Tiger White will be rewarding fans with unexpected twists to prizes in a new online contest. Five months after its launch, Tiger White – Asia’s Wheat Beer returns to bring about more delightful surprises for fans beginning with an online contest that will unlock extraordinary, unexpected experiences from now until June 2. The new wheat beverage made its debut appearance with a creative initiative that saw the release of ‘Coaster’, a short-film produced via a local crowd-source effort in collaboration with renowned blockbuster director, Baltasar Kormákur, for that extra sweet cherry on top. 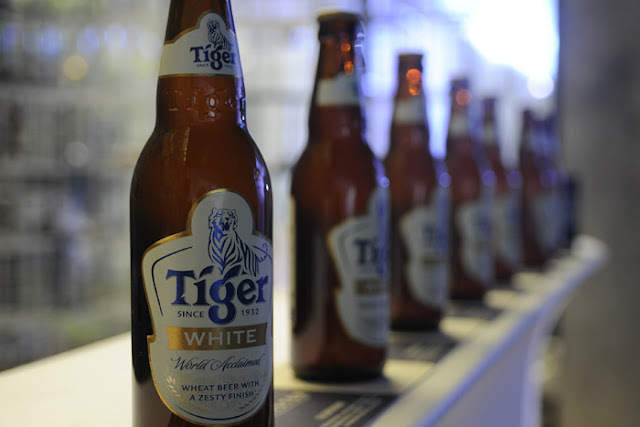 Bottled with subtle spicy hints of clove, coriander, and orange peel for that smooth refreshment with a bite, Tiger White’s origin is unique in its own right, being a wheat beer brewed in the heart of Asia. Tiger Beer marketing manager Jessie Chuah said, “As an innovative product, Tiger White continues to stay true to its inventive DNA, to always evolve and deliver new and exciting experiences for its consumers, hence the emergence of this contest. “While it may seem simple, there will be a twist that comes with each prize. The winner will only find out the full extent of the surprise when he or she wins. Participate to find out,” Chuah urged. The contest will run over the course of seven weeks with five winners for each of the prizes such as an all-you-can-eat fiesta prepared by your very own private chef, a dining in the dark session, a sensational movie night, and a luxurious overnight jungle retreat up for you and a friend. Tiger White assures the ‘twist to the prize’ will complete the experience in an unexpected memorable manner. The label will roll out the online contest with a video where the questions are derived. The short clip will be viewable via Tiger Beer’s social platforms, and/or at a specially created microsite, www.tigerwhite.com.my where participants can submit their entries to win one of the four experiences. Full contest details within.